Photograph courtesy Cumbrian Railway Association (File ref WAR201) A grubby D7568 coasts throught Hest Bank station. The twenty one year four month career of D7568/25218 included allocations to London Midland Region & Eastern Region depots. Carried green livery with TOPS numbering (approx 3/74 to 1/75). Time between last Classified repair and withdrawal: 69 months. February 1964 to Nottingham (16D). August 1967 to Holbeck (55A) on loan, made permanent September 1967. 25218 was the 233rd Class 25 to be withdrawn, one of five retired during January 1985. 25218 was stored at Bescot prior to movement to Swindon Works on March 27th 1985 and broken up there by the end of May 1985. 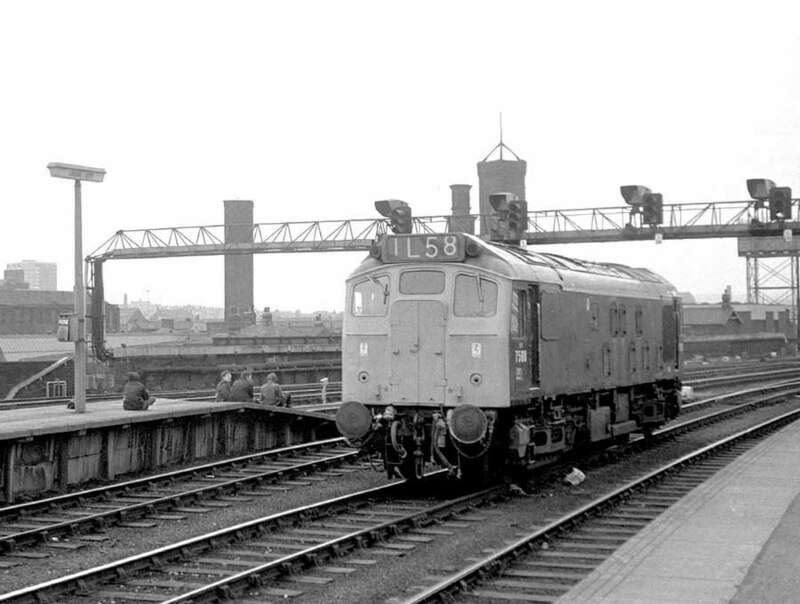 Noted Derby Works October 1964. Noted Crewe Works November 1974 - January 1975 (Classified, painted from green to blue but gangway doors not removed). Noted Derby Works March - April 1979 (Intermediate Repair - gangway doors sheeted over). Noted Swindon Works March - August 1980 (Collision damage). Noted Derby Works November 1980 (Rectification). Noted Derby Works September - October 1982 (power unit repairs). Noted Derby Works July - December 1983 (power unit & fire damage repairs). 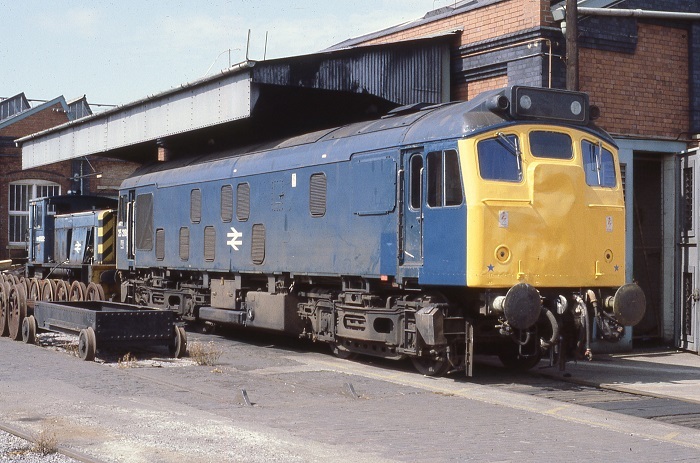 D7568 was the first of the Class 25/2s coming from a batch of ten (D7568 - D7577) delivered from Derby commencing September, with D7568 to be allocated to Toton (18A). 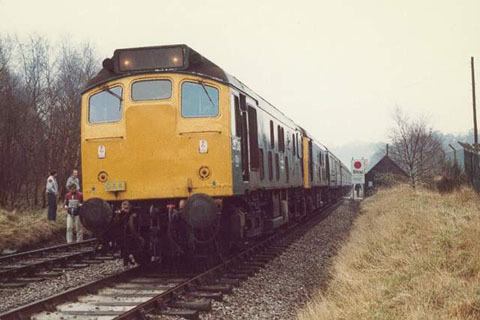 In order to accomodate the redesign of the Class 25 bodyshell Derby had transferred the last batch of its Class 25/1's (D5223 - D5232) to Darlington, with Derby using the older style body shell for these first ten Class 25/2's before revealing the new cleaner style in the shape of D5233. D7568 made its Corby test run on September 19th 1963. Photograph collection of webmaster Brand new Class 25 No.7568 in Derby Works yard on September 22nd 1963. The 1T48 headcode suggests the locomotive has been involved on its test run with coaching to Corby & back. 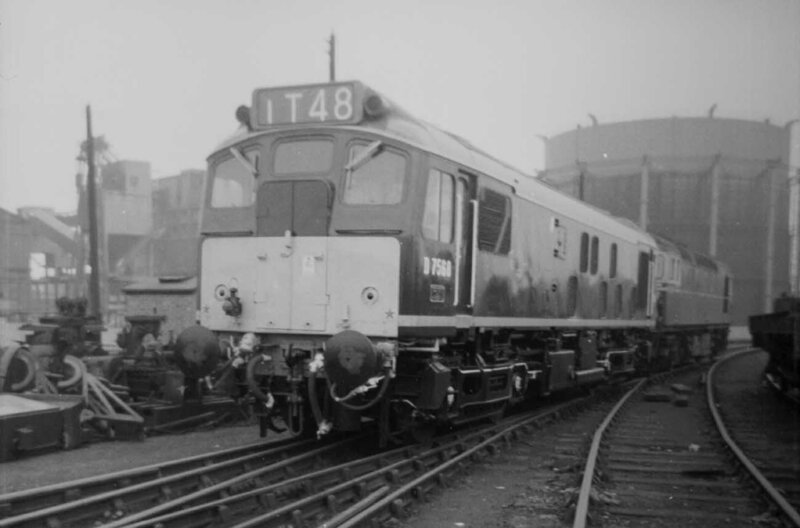 In March D7568 was transfered to Derby (16D), followed by a move south in December to Cricklewood (14B). It would be noted at Derby Works during October. On August 27th the summer dated roundtrip Nottingham - Llandudno Town was worked by 7568 & 5240. During August Toton's boiler equipped D7568 - 7573 were sent to Leeds Holbeck (55A) in exchange for D7627 - 7632, these being used to replace steam on the Leeds - Bradford workings. An Open Day at Leeds Holbeck on September 30th, no doubt celebrating the twilight of steam in the area, especially the few remaining Jubilees, found the following Sulzer Type 2's on 'display': D5096, 5100/73/79, 5254/90, 7526/48/68-70/95 & 7625. D7568 was at Derby Works during February. 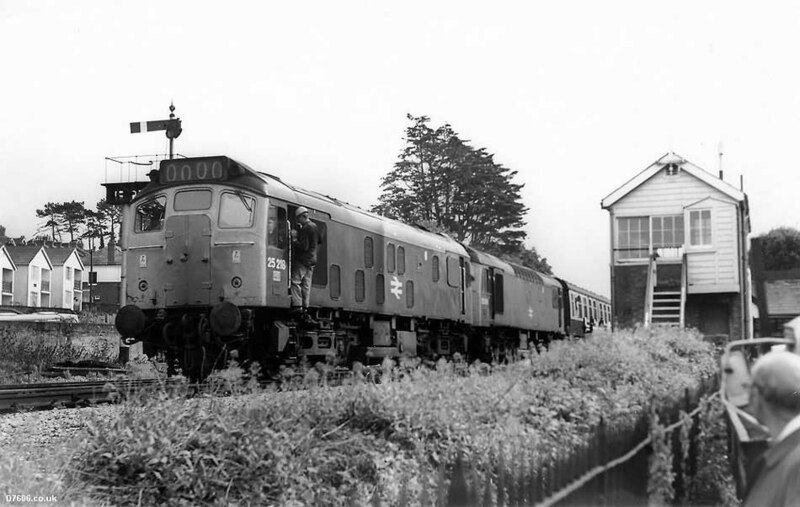 70013 was again used on an RCTS organized 'The Dalesman No 2 Railtour' on June 16th 1968. This tour departed Leeds with D7568 and nine coaches, 70013 taking over at Stansfield Hall for a run over Copy Pit and various lines between there and Carnforth. On the return D5113 replaced 70013 at Skipton for the run up the Grassington branch, the short run round loop there required a little extra shunting to complete the run round manoeuvre. On November 5th the 09.20 Kings Cross - Bradford Exchange was worked forward from Leeds by 7568. On June 13th 7568 worked a Leeds - Bradford Exchange service. On July 1st, 6th & 7th 7568 worked the ten coach 18.25 York - Leeds (for Manchester?) Service. On August 7th 7568 worked the 09.10 Bradford Exchange - Poole to Nottingham. 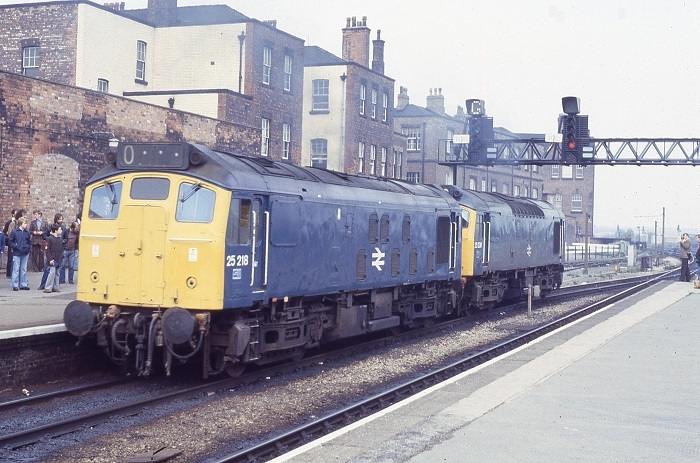 Photograph courtesy Tony Sayer 7568 at Leeds City on July 27th 1971. 7568 was allocated to Holbeck for five years. Cross-London workings continued to be frequently worked by Class 25s, noted on June 20th & 21st were 5277 & 7568 on the Toton - Southfleet coal train. The Nottingham Division (D16) became 7568's new home in August. Condition August: green livery with full yellow cabfronts, grey roof, gangway doors in place, blanking plates fitted, hand/footholds in plated over, straight sided sandboxes at No.1 end, ridge sided sandboxes at No.2 end, three rung bogie mounted footsteps. On August 27th 7568 & 7670 were noted on an unidentified roundtrip Derby - Yarmouth service, assumed as far as Norwich but may have worked through to Norwich. A Nottingham - Altrincham football special on November 18th featured 5223 & 7568. During the early afternoon of March 24th 7568 & 7562 were noted at Exeter having arrived with the 6Z42 Earles – Exeter Central cement. The 20.43 Birmingham New Street - Peterborough was worked by 7568 on April 29th. On September 9th the 'King of Oban' railtour was worked by 7568 & 5231 between Glasgow Queen Street & Crewe, routed via Beatock, Ais Gill and Chester. A roundtrip Burton on Trent - St. Pancras day excursion (shoppers special?) was worked by 7568 & 5225 on December 8th. On March 24th the 20.43 Birmingham New Street - Peterborough was worked by 25218. 25218 received an overhaul at Crewe Works from November 1974 to January 1975. The Nottingham - Llandudno was worked by 25218 on July 19th. On March 30th the 07.10 (?) Derby - Matlock and the return 08.00 Matlock - Derby were worked by 25218. On April 17th an Alfreton - Yarmouth excursion was hauled by 25076 & 25218. The Derby - Norwich - Yarmouth - Norwich - Walsall diagram was worked by 25218 & 25037 on May 29th. On September 11th the 09.49 Nottingham - Paignton was worked by 25218 & 25258. 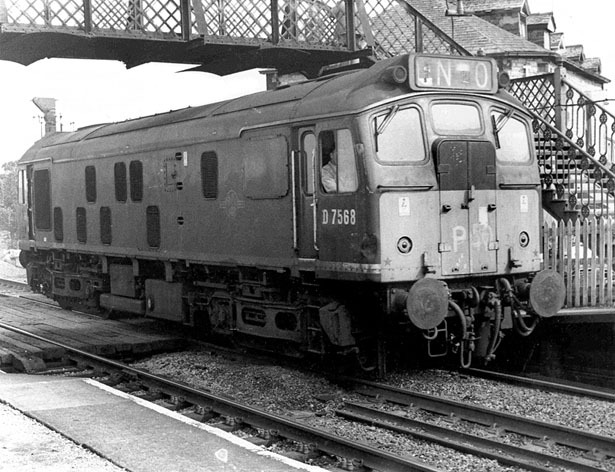 The locomotives later returned the empty coaching stock northward as the 5Z97 17.45 Newton Abbot - Sheffield. Photograph collection of Ian Hammond 25218 & 25258 at Sands Road Crossing, Paignton on September 11th 1976. A Spondon - Rosyth special load was noted on the ECML with 25218 on October 30th. Engineering works saw the special diverted via Carlisle, the load included a sleeping coach for personnel travelling with the special load. On April 29th 25218 worked a four coach Nottingham - Harwich special, then running as empty coaching stock to Cambridge to become the 1Z69 13.30 special to Nottingham on May 1st. On May 12th 25218 worked the evening Stoke - Healey Mills freight. The early part of June proved to be a busy time for 25218 on passenger workings. On June 4th 25218 & 25269 worked the Derby - Norwich - Yarmouth Norwich - Derby diagram. Overnight 25269 was replaced by 25184 and for the next four days this pair of Class 25s covered the Leicester - Skegness (5th) or Derby - Skegness circuit (7th, 8th, 9th). With 1977 being the Jubilee Year for Queen Elizabeth II, the Monarch and family made many public appearances, making considerable use of the new Royal Train. A visit to Stockport on June 21st ended with the Royal Train utilised for the journey to Porthmadog. The running west of Shrewsbury was handled by 25221 & 25222. After staying overnight at Porthmadog the train ran to Harlech, where the Royal Family took to road transport. From Harlech the empty coaching stock was taken forward by 25218. 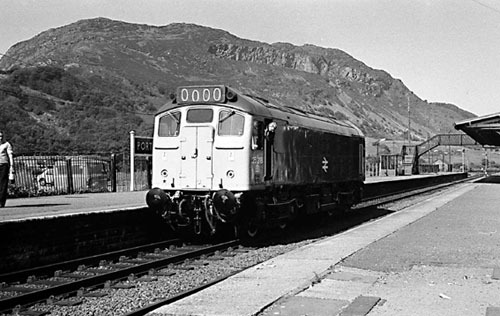 Photograph courtesy Pat Webb 25218 at Portmadoc on June 22nd 1977, the Royal Train pilot locomotive. On July 16th the 08.10 Derby - Yarmouth was worked to Norwich by 25218 & 25136, 31131 worked the return diagram. On July 30th 25218 & 25175 busy working a round trip Derby - Yarmouth service. During the third week of October 25218 was noted working passenger services over the Crewe - Cardiff route (15th & 16th). 25218 moved to Cricklewood during December. On May 20th 25184 & 25218 worked a Wellingborough - Chester excursion. The 09.19 Manchester Piccadilly - Yarmouth and the 09.15 return working on June 10th were worked by 25218 & 25130 over the Manchester - Lincoln legs of this service. October 21st 1978 finds 25218 & 25208 at the north end of Derby Station having arrived from St Pancras with the DAA/DEG 'Lindisfarne' railtour. The Type 2s were replaced by 40013 & 40015 for haulage as far as Carlisle. The return trip ran into a series of problems south of Sharnbrook. On October 31st 25218 worked the 09.35 Carlisle - Nottingham forward from Leeds. An intermediate repair was carried out for 25218 at Derby during March & April. On April 14th 25040 & ex works 25218 powered a Euston - Pwllheli excursion forward from Wolverhampton, 25218 was removed at Machynlleth after failing en-route. 25040 made the round trip to Pwllheli alone, but gained 25122 from Machynlleth for the return trip to Wolverhampton. Interestingly 46011 was added at Shrewsbury, reportedly for heating purposes! 25218 was noted at Derby on April 27th with some Research Department vehicles. 25218 was back on the Cambrian on June 9th, this time attached to 25212 working the 10.10 ex Euston forward from Birmingham New Street & returning with the 16.10 to Shrewsbury. On July 29th 25218 & 25288 assisted two services between Northampton & Bletchley due to the power being off for enginering work. On August 27th a southbound motorail service was worked by 25218 between Willesden & Kensington Olympia. On March 19th 25218 received a crushed cab in a shunting incident at Stonebridge Park. At this time such damage could easily have led to the withdrawal of the locomotive but repairs were sanctioned. Due to a general Works backlog which included Derby & Glasgow, this unclassified repair was sent to Swindon Works, with 25218 spending March - August undergoing repair. Whilst under repair at Swindon the locomotive was transferred to Kingmoor. 25218 & PWM652 rest at Swindon Works, August 8th 1980. 25218 was one of the few class 25s to receive repairs at Swindon, required after receiving a crushed cab at Stonebridge Park. During November 25218 was at Derby for rectification work. By month end it was out and about on 30th's 13.45 Glasgow - Carlisle produced 25218. On October 18th the 13.15 Birmingham New Street - Norwich was worked by 25218 & 25054, presumed throughout? The 13.45 Glasgow Central - Carlisle was worked by 25218 on November 30th. On May 8th 25218 worked the 16.02 Crewe - Cardiff. A foray into the West Country found 25218 working three local passenger trains on July 13th, starting with a late afternoon Paignton - Exeter followed by a round trip over the Barnstaple branch. In contrast during the first week of August it was joined by 25213 and spent much time on the Motorail services at Kensington Olympia, being noted on these services on July 31st, August 3rd, 4th, 5th, 6th & 7th. On September 19th 25218 & 25054 worked the 04.10 Shrewsbury - Aberystwyth and the 10.07 return service to Euston as far as Wolverhampton. Four days later on September 23rd 25218 handled the 13.15 Birmingham New Street - Norwich, a journey of 174 miles, the longest regular passenger diagram for a Class 25 at this time. On its return working 25218 expired just outside of Leicester, a Class 08 drew the train into the station where 31114 took it on to Birmingham. During April 25218 was on the Glasgow Central - Carlisle passenger turns, being noted on 2nd & 9th. 25218 was stabled at Polmadie on April 10th. 25218 worked the 11.05 Perth - Edinburgh on April 13th. On May 3rd 25218 worked the 19.28 Crewe - Cardiff, two days later it worked (with 25244) the 07.40 Euston - Aberystwyth from Wolverhampton - to Shrewsbury. 25218 was stabled at Saltley on May 14th. On July 3rd the 07.40 Euston - Aberystwyth was worked between Wolverhampton & Shrewsbury by 25218 & 25244. On July 20th 25218 failed whilst working the 19.30 Crewe - Cardiff near Shrewsbury, 25297 dragged everything forward. 25218 & 31280 were stabled at Hereford on July 28th, later this day 31280 arrived to take 25218 to Crewe. Back on the Scottish Region 25218 teamed up with 25237 (or 25244?) for the 23.05 Edinburgh - Perth on September 10th. During the middle of September 25218 was received by Derby Works for power unit repairs, carried out during September and October. A Derby St Marys Yard - Tutbury trip freight was worked by 25218 on November 16th, with one long wheelbase van and a brakevan. After release from Derby it was more Scottish workings for 25218, on November 29th it worked the 08.40 Carlisle - Glasgow Central, coming back the next day (30th) with the 13.45 to Carlisle. 25218 was noted light engine at Hightown to pick up spoil wagons during engineering work on Merseyrail's Northern Line on December 12th. On the same date 25218 was noted at Hall Road with a track layer and coach. On New Year's Eve 25218 was diagrammed for the 13.06 Preston - Nottingham, unfortunately the locomotive expired near Romiley, assistance coming from 40034. 25218 was noted southbound at Cudworth on January 4th with a mixed freight. On March 7th the 13.15 Stranraer Harbour - Glasgow Central failed near Dalry behind 27023, 25218 dragged everything to Glasgow Central. The 08.50 Carlisle - Glasgow Central was worked by 25218 on April 18th, the next day (19th) Glasgow sent it out on the 08.35 to Stranraer Harbour, returning the following day (20th) with the 07.32 to Glasgow. 25218 was noted northbound at Lawrence Hill on May 3rd. 25218 & 25240 headed southbound with an engineer's permanent way train at Warrington Bank Quay station on May 12th. Further power unit repairs (and possibly fire damage) were undertaken to 25218 at Derby Works between July & November, 25218 reportedly sustained fire damage on June 7th at Gretton (near Corby). On January 31st 25218 was stabled at Preston. 25218 was noted passing Wigan North Western with a southbound train of caustic soda tanks on January 20th. The first week of February found 25218 again active on the Carlisle - Glasgow services, covering four trips on 3rd, 4th & 6th. March 10th found 25218 & 25059 on railtour duty, working DAA's NW Rambler No.3 roundtrip between Stoke on Trent and Leek Brook Junction. Photograph courtesy Nick Ross 25218 & 25059 on railtour duty at Leekbrook Jct on March 10th 1984. The wee hours of April Fools Day found 25218 on the 02.35 Euston - Bletchley, the following week (8th) due to the power being off for engineering purposes 25218 assisted two electric services between Willesden & Euston. On April 11th the 07.16 Manchester Victoria - York was worked by 25218. On April 28th 25218 was stabled at Cockshute. Further electric assistance occurred on June 7th when damage to the overhead equipment at Bay Horse required 25218 to assist 87004 on the 15.20 Glasgow - Nottingham between Lancaster & Preston. On August 9th 25218 & 25078 came to the rescue of 47354 which had failed south of Hereford on a Severn Tunnel Junction - Walton freight. Two days later (11th) 25218 & 25205 worked the 10.10 Euston - Aberystwyth forward from Wolverhampton, coming back with the 17.05 to Shrewsbury. Diesel multiple unit assistance took place on August 18th helping a Worcester service forward from Stourbridge Junction on to Birmingham New Street. On August 29th 25201 & 25218 were noted southbound through Warrington Bank Quay with oil tankers. 25218 was stabled at March on September 1st. The last recorded passenger workings of 25218 took place in November, on the 18th 25218 worked the 10.50 Birmingham - Manchester service as far as Wolverhampton, having run via Bescot. 25218 was noted eastbound at Guide Bridge on November 21st with a freight. On 25th it worked a relief 22.45 Preston - Liverpool service, covering for a late running 18.20 Glasgow - Liverpool. 25218 was the Manchester Victoria banking locomotive on December 7th. The end came on January 28th for 25218 when it was retired from Kingmoor depot, initially being stored at Bescot. On March 25th 08095 & 25182 left Toton for Bescot where 25076 & 25218 were added to the convoy, finally arriving at Swindon on March 27th. Unlike many Class 25s reaching Swindon 25218 was quickly cut up during May. No.1 end headcode panel: nothing displayed: (OK March 1981) November 1982 until withdrawn??. No.1 end driver's side window frame: unpainted: November 1982 to ?? At least one cabside panel with number and TOPS panel escaped scrapping. Page added January 23rd 2001.